You will fall in love with "The Palmetto Blue" located in Inlet Beach. This beautiful home has 4 bedrooms & 4 bathrooms. Upon arrival you will be greeted with neutral colors and a cozy, relaxing beach feel and the unique barrel ceiling at the front door is sure to grab your attention. On the first floor, you will find a 2 bedrooms. The first is a king guest room with it's own private bathroom that has a tub shower combo. Just down the hall past the laundry room, you will find the spacious master bedroom. This room features a king bed, large flat screen TV, and built-ins for storing all your belongings. You will love the master en-suite with the dual vanities, walk in shower plus a separate soaking tub. Head up the stairs to the 2nd level. Your group will enjoy the open concept living, kitchen, and small sitting area. The well appointed kitchen has granite countertops, stainless steel appliances and a huge island. There is a large dining table for games or family meals. 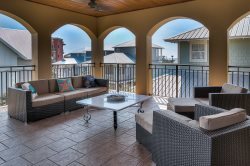 Step outside onto the balcony to enjoy the great views of the Emerald Coast. Also on this floor is a shared bath with walk in shower, plus the 3rd king bedroom. As you walk up the stairs to the third level of the home you will find the living room. Sink into the comfy sofa and watch your favorite movie on the large flat screen TV or cozy up by the fireplace on a cool beach evening. Walk out on the balcony and enjoy the beautiful gulf views! Located on this floor, is the 4th king bedroom with shared bath. The large shared bath has double vanities and a shower/tub combo. The community pool is just a few steps away and the beautiful beaches of Inlet Beach are just down the street. With a diverse array of homes, shops, and restaurants, Inlet Beach is sure to become a favorite South Walton community! Escape to The Palmetto Blue….the perfect place for your next beach vacation.